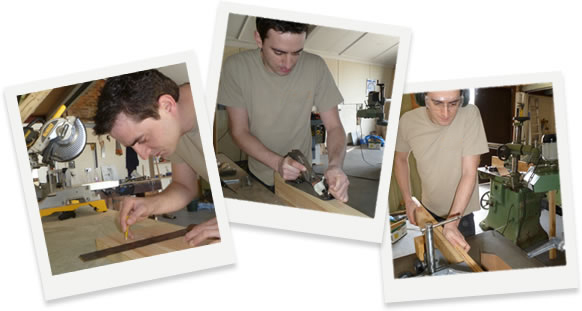 Nick’s career as a qualified Bench Joiner started when he was just 17 when he applied for an apprenticeship with a Joinery firm in his home town Farnham, Surrey. After which he then went on to achieve a City & Guilds NVQ 3 Award in Bench Joinery. After building on his experience working with local firms, he decided to set up a business for himself where he could relay his passion and expertise into a flourishing business of his own. Nick’s wife, Caroline, grew up in Sidmouth. She moved to Surrey to pursue a degree, and then a career in brand design. She met Nick in 2004 whilst living in Farnham, and when they married at Kennaway House, Sidmouth in 2013, it felt natural to return to her hometown where Nick could relocate his already 6-year old joinery business, bringing his extensive experience with him. With a fully kitted workshop based in Salcombe Regis now, Nick spends his days making anything from windows and doors to entrance gates and indoor furniture. Transforming slabs of oak into bespoke Edwardian period gates is all in a days work for Nick! Crafting wood to an exceptional standard is, quite literally, engrained in Nick’s work ethic. He’s a natural perfectionist and gets huge satisfaction knowing his craftsmanship brings pleasure and practicality to people’s homes or workplaces. He leans on his smart understanding of wood types to advise his customers and carefully sources the right suppliers; suppliers who have the same pride and standard in their product as him. Thorn Business Park, Salcombe Regis, Sidmouth, Devon. Nick's unit is perfectly located at the top of Salcombe Hill allowing easy access to locations across East Devon and the Jurassic coastline, including Sidmouth, Beer, Branscombe, Seaton, Lyme Regis, Axminster, Honiton, Ottery St Mary, Exeter, Topsham, Exmouth and Budleigh Salterton. Whilst Nick’s business is small, his smart set up means his productivity is high, his turnarounds are swift, his prices are confidently competitive against other larger firms and his techniques are to a standard he's truly proud of. Most of Nick's time is spent working in his unit so if there's a project you have in mind that requires internal or external woodwork tailored to a custom size or shape, then please do call to discuss it with him and he'll arrange an appointment with you to visit. In his own time, Nick loves to fish off the coastlines. As a keen course fisherman before moving to Sidmouth, Nick now spends his spare time enjoying as much beach and boat fishing as he can, and learning as he goes. He’s joined a fantastic circle of like-minded fishermen in and around Sidmouth, and if he’s not out on a boat off the north coast of Devon, you’ll often find him fishing at Jacob’s Ladder, Branscombe or Chesil Beach.